Katy Brand’s first foray into scriptwriting gives us 3Women, a well-written, funny and emotional delight. Across three generations, three women come together on the eve of Suzanne’s (Debbie Chazen) wedding. Suzanne’s mother Eleanor (Anita Dobson) and daughter Laurie (Maisie Richardson-Sellers) join Suzanne in the posh hotel suite that her husband-to-be has laid on so the ladies can bond and have some family time together before the big day. Needless to say, this evening is somewhat of a struggle, more for Suzanne and Eleanor than for Laurie. There’s tension between Suzanne and Eleanor that comes to a head when Suzanne confronts her mum about her drinking and what it did to the family. This seems to go against the usual “hippy-esque” type character of Suzanne that Chazen manages with ease. You get the sense she hasn’t stood up to anyone like that for some time, if at all. Dobson is sublime as Eleanor, the alcoholic, old-fashioned, cold and almost aloof grandmother and mother. Her comic-timing is a dream and she can really deliver those one-liners Brand has written. In fact, Dobson’s mere facial expressions are enough to get the audience laughing. This is the first stage performance I have seen Dobson in and I am going to make sure it isn’t the last. Both Suzanne and Eleanor are the best-written characters with the most development through the 80 minutes. As both progressively get drunk their capacity to endure each other wains, ah heck it actually disappears entirely! You can easily be forgiven for forgetting your watching a play and not a mother and daughter finally losing it with each other. The time Dobson and Chazen must have put in to get this relationship so authentically on stage doesn’t bear thinking about. Richardson-Sellers is great as Laurie and her modern outlook on many things provide plenty of opportunities for the confused Eleanor to deliver one of her “looks” or an excellent one-liner, the best being around Laurie’s gender fluidity. Again the connection and ease on stage, mainly with Chazen, is wonderful. Of the three women, I think Laurie is the one character that could have done with something slightly more demanding from Brand but that really is nitpicking. A genuinely funny and moving piece well acted and a delight to watch. The only slight negative being a couple of the really emotional and angry sections felt less natural and more acted but that really is more nitpicking and as there have now been a few more shows I imagine it is much smoother now. All in all well worth catching before the run ends on 9th June 2018 if you can. 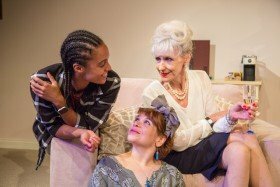 3Women, the debut play by the award-winning comedian and writer Katy Brand, will premiere at Trafalgar Studios 2, starring the celebrated screen and stage actress Anita Dobson (Eleanor), alongside Debbie Chazen (Suzanne), Maisie Richardson-Sellers (Laurie), and Oliver Greenall (Waiter). Running from 15th May to 9th June 2018, with press night on 18th May, 3Women explores the relationships between three generations of the same family, brought together in one hotel room, in a darkly comic and pertinent exploration of what it means to be a woman.